The weekend was a hoot and will go in as a fun filled memorable one in my personal history book. It’ll remain etched in my mind for years to come. It was a series of firsts for me. 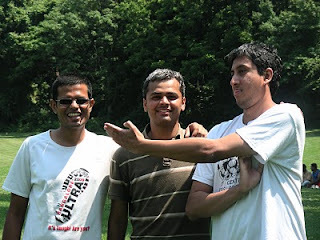 If meeting my chaddi dosts Manoj and Uday, whom I have already known for more than 25 years in my 30 years of life in a foreign land was exciting enough, golfing, biking, playing cricket together in a little known city called Harrisburg in the northern hemisphere was an icing on the cake. Stitching all the events spread over the weekend made a fantastic panoramic mental picture. It was Sunday afternoon. Manoj, Uday and I were treated with some good food (Thanks to Kalpana et al) at a friend’s baby shower party. After filling our bellies we escaped from the scene to bike the Green belt around Susquehanna. We reached Susquehanna Outfitters, a bike rental company in City Island around 4 PM, quickly introduced my buddies Manoj and Uday to Steve who owns the rental company. Manoj, was excited and It didn’t take us too long to notice that he was in his comfort zone. It was gonna be a routine drill for him. We rented two bikes; Uday picked up a larger frame Trek and Manoj knew what he wanted. We quickly headed out of the Island to hit the Green belt trail. We biked on the iron bridge, made a steep descent to the trail around the river. It was an exciting moment. While Manoj and I have biked together many times (2 years from Sanjayanagar to Malleswaram) in the past, it was the first time the three of us were biking together. We started nice and easy, clicking some pictures, and headed towards the PennDOT. I picked up a map of the Green belt, as it can be a little confusing in certain parts. We quickly saw ourselves pretty comfortable on the bikes and headed towards the Cameroon street, under a thick canopy of trees into the Five Senses garden (Uday, would begin to feel his rear sense here). There was one spot where Manoj instinctively was biking on the left hand side of the trail and had to remind himself that he was in the US. As we biked along the trail, we talked. Can’t really remember what we talked about, but I know we were laughing and yelling at each other and we definitely had fun. We biked past Paxton street, waiting for quite some time for the traffic light to turn green for us pass through. When we reached the Reservoir Park, it was the first of the many uphills we would bike. I was glad that Manoj was around to help me and Uday with the technicalities of gears and we gradually but steadily conquered the first uphill of the day utilizing the granny gears to the fullest…hurrah! Delighted I sure was. It’s the downhill that makes that salty drop of sweat running down your forehead, those aching muscles that scream at you on the uphill so much worth it. “Don’t be afraid of the uphill, there’s surely a downhill”, I am trying to apply this principle to every aspect of life. So far seems to be working. We soon hit the State Street, crossed the street to get on to Herr Street, and hit the trail again. Now we were on some 8% -10% grade inclines. Slowly, I was getting comfortable with the bike and the gears. 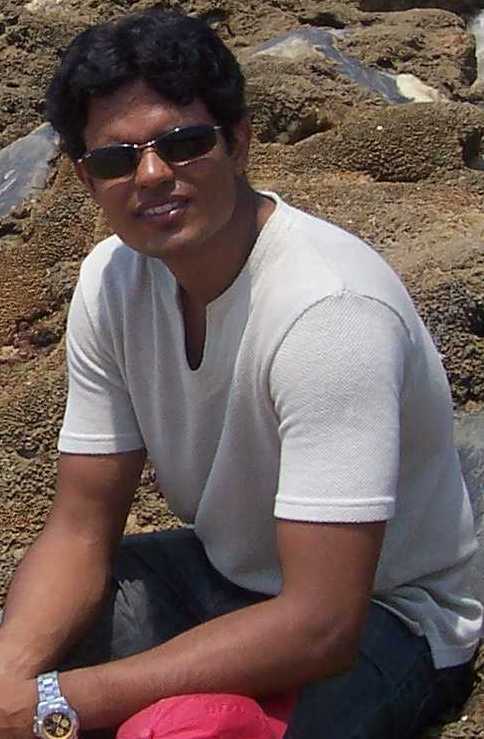 Manoj kept Uday company and encouraged him to push harder. We learnt that of the three of us Manoj is the most patient and I am the least. Soon, we made it Lower field, the Mecca of cricket buffs in Harrisburg. “Whackers” vs “HACC” cricket match was in action. We stopped and caught a glimpse of the match and gulped down a bottle of water. We continued to pedal, and made our way through HACC (Harrisburg Area Community College). Uday seemed amazed at how I had discovered the biking trail. It was just talking to folks in my office that I came to know about the Green belt. When we entered the Wildwood lake area, I could feel that Uday was pushing himself harder than ever. After a few steep uphill climbs, we saw ourselves biking on a thrilling downhill trail. Manoj went ahead of us and captured a video of us biking downhill. Finally, we came onto the Front street area, which reminded Manoj and me of Jayanagar, Jayamahal areas of Bangalore. We biked passed the Governor’s mansion (Governor Ed Rendell) and took a few pictures along the way and finally came back to City Island. It was close to 20 miles and 2 something hours of biking. Burnt loads of calories, thanks to Manoj’s fancy GPS watch. We returned the cycles and thanked Steve and headed back to the car. The experience was priceless. Blessed we were for the wonderful day!